I went vegetarian for the month of January. I really just wanted to see if I could do it. Turns out, it was surprisingly easy. This was not done with political or moral convictions on my mind, as I have no problems with consuming meat and entered the month knowing it was not to be a permanent conversion. Still, it was an eye-opening and educating experience and I feel like I’m the better for it. For example, seeing restaurants through the vegetarian lens was quite enlightening. Suddenly, I had to actually pause and think before heading out to make sure that the location of choice was accommodating enough. Not that this was a huge dilemma, since Austin, it turns out, is an incredibly vegetarian-friendly city and I didn’t suffer through the month feeling like a martyr, because I most assuredly was not one. I didn’t even bother telling most people about my little personal challenge, although my friends and coworkers inevitably found out. There was a lot of expected teasing, and both my omnivorous and vegetarian friends were intrigued that I would dare to attempt such a feat with my infamous appetite. I did feel hungrier than usual at the beginning of the month, but that feeling quickly went away as I ate smaller portions more frequently. Toward the end I felt perfectly normal. One thing I liked about this month was that it forced me to better plan my meals ahead, and I had to cook for myself almost every day. My consumption definitely became healthier, since I didn’t fill up on carbohydrates and ate a lot more raw vegetables. I took a few pictures of things I ate through the month, but I just decided it’s not worth posting them here because I was a poor documentarian and forgot to take pictures of the more interesting things I cooked. Oh, well. Despite this, I don’t think I lost much if any weight through the month, though I forgot to weigh myself at the very beginning of it. I didn’t work out less, and I didn’t notice an appreciable change in my energy levels. The question I got most from “meat-eaters” was something along the lines of “Aren’t vegetarian diets dangerous because you might miss some nutrients you can only get from meat?” Most people I heard this from didn’t even know what those nutrients are. Being essentially raised by two nutritionists made this easy for me, since I was already aware of these potential issues going in. I compensated by choosing specific foods and taking some dietary supplements. The question I got most from vegetarians and vegans was “So are you going to eat meat again after this month?” The answer to that was always yes, and I doubt anything would have changed my mind. Sorry, folks. Meat is just too dang delicious. I just ate my last vegetarian meal for the month: An omelet with peppers, onions, tomatoes and mushrooms. What, you think I was going to give up eggs, too? 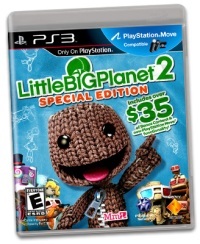 Yes, we already have an excellent review of vanilla LittleBigPlanet 2 by our very own Scott. Not to sound lazy, but I’d rather not retread such well-trodden ground, so you can refer to his review to learn about the basics and content of the original release. This review is for LittleBigPlanet: 2 Special Edition, and will cover only the newly added content to the already superfluous LBP package. My 2011 tale is one filled with regret and shame. I’d love to regale you with a long list of magnificent titles like everyone else preceding me, but the sad fact is that I hardly beat any games last year. And the list of games I even bothered to play at all is not much longer. Sure, I was busy with work, writing, and other mandatory components of life, but I don’t want to make excuses.